2Pl, we trained him well..! Further: Bob retired as Colonel of the Regiment this month, his replacement is Colonel Baden Ewart [NZ Component 1970-71] who spoke at the 40th Anniversary Dining-in. 'With ANZAC's in Vietnam - a photographic record of 6RAR/NZ (ANZAC) Battalion 1969-70' features hundreds of colour and black and white photos taken during the war by sixteen Australian and New Zealand members of the unit. Most were from private collections and not otherwise published. Mark Binning was one such contributor [and I will update this comment if he cares to provide a review]. The author is Rob Laurent who served with 6RAR as a company medic. More details on the book and how to purchase a copy is at this link. Maria Dorsey is a Ph.D student at Otago - "I am a Ph.D student at the University of Otago undertaking research that involves the Vietnam War. More specifically, my research addresses the phenomenon of New Zealand Vietnam War Veterans returning to Vietnam post war and how these visits may serve as a step to reconciliation between the New Zealand Vietnam War Veterans and the Vietnamese. The results expected from this research is hoped to bring a better understanding of the affects of post-war visits on the reconciliation process between former foes. At this point I am looking to conduct interviews with Vietnam Veterans who have and who have not traveled to Vietnam after the war. I would like your organization's support in locating New Zealand Vietnam Veterans who may be interested in taking part in this research." If any veteran would like to participate contact Maria and request further details of the topic. Your note about the 1970 All Black tour has prompted me to send you this photo taken by Zilla at the opening of the new Rugby Museum in Palmerston North on 11 August. It features Sir Brian Lochore who opened the new Museum and was captain on the 1970 tour. During the World Cup we averaged about 1000 adult visitors per week and the feedback has been very positive. I have been working on the database changing the records to reflect the new location of each item. We have 40,000 items recorded and I find that I tend to read the "provenance' of the more interesting items. We have a display called the "Rare XV" and one of those items is the cap awarded to Gordon Williams a member of the 1888 Native team that toured the UK. Gordon is the grandfather of Maj Gen Robin Williams and it was Rob that donated the cap some years ago. 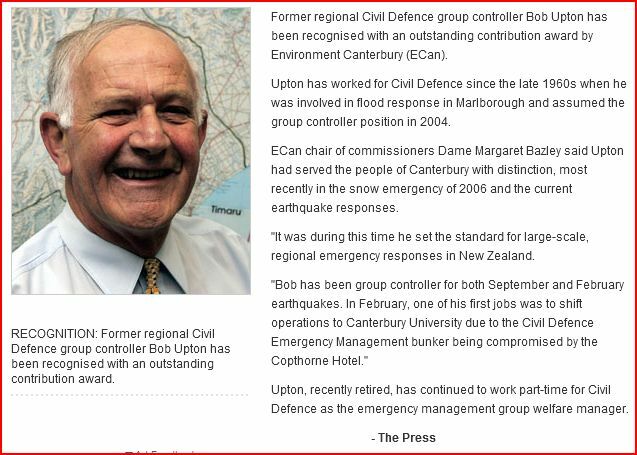 Authorities [highly likely to be Baden Ewart NZ Component] have announced the latest list of buildings in Christchurch damaged in the recent earthquakes that are to be demolished. Included in the list is the Latimer Lodge, our base in November 2010 for the 40th Anniversary Reunion. There are photos of the demolition in progress and a sketch of the replacement hotel at this link, the bottom photo is of the dining-in venue and bars. I have learned today that 'Stretch' Bridge died in Kadina South Australia in July this year. The news comes from a lady whom I was helping to locate Henry's wife for a school reunion. Henry is survived by his wife Lorraine to whom he was married for around 40-years, and three sons. 41790 Pte Henry Gaine Bridge, 1RNZIR W3, Borneo. Army nickname Stretch. Age 65. 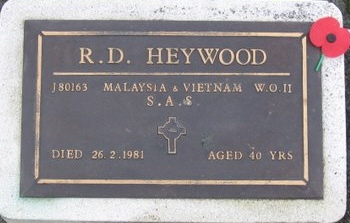 Died 27 July 2011. Car accident. Henry was CO Kadina/Port Pirie Australian Air Force Cadets and was travelling home to Kadina (from Port Pirie) when the head-on occurred, killing both drivers, no others involved. The Public Funeral was at the 10/27th Drill Hall Kadina 2pm Monday 8 August attended by over 600 persons, many military (OC Air Cadets from Canberra) and Lodge. Survived by wife Lorrie and three sons - Regards, Chris. Applications for the New Zealand Defence Service Medal (NZDSM) have now opened for ex-Service personnel who are 60 years of age and over. The New Zealand Defence Force Medals Office was previously accepting applications for the NZDSM only from ex-Service personnel aged 70 or over. Since April, when the first applications were called for, over 12,000 applications have been received by the Medals Office and over 8,000 medals have been issued. Due to the large number of people eligible for the NZDSM, the call for applications is being managed in four stages, with priority given to processing applications from the oldest living ex-Service personnel first. The new medal, which was announced by the Prime Minister last year, means that a large number of personnel who served New Zealand loyally and well in a wide range of roles and contexts, but not on operations, are now receiving medallic recognition. Ex-Service personnel are encouraged to apply for the medal using the online form on the NZDF Medals website. Hard copies of the application form are also available through the website and at most local RSAs who can provide staff to help ex-Service personnel fill in their applications. NZDF have set up a helpline for people with questions about the NZDSM, if you require assistance please call 0800 334 772 during business hours. I am presently reading the V4 book and will do a book review when I finish but I can already recommend it based on the first 50-pages. This part of the narrative covers NZ training and the Terendak scene in much detail and in a way only those who were there could remember. They also establish that Lima Karaka replaced Sgt Theo Marama in November 1969 so for all intents and purposes it can be safely assumed that Lima did not see any significant service with ARU or NZ Component. I got my copy of the book from the public library. Bill Blair was involved in a serious head on accident near Weedons [just South of Christchurch] at about 1600 hrs last Friday. Bill was the innocent party and in his car by himself. I have just been to visit him in Christchurch Public Hospital, Room 1, Ward 19. He was in very good spirits. His right leg is broken just below the knee and he has a broken finger. There is a lot of missing skin and muscle tissue around the leg break that is going to require grafting and plastic surgery therefore he is likely to be in hospital for at least another 10 days. I am sure he would like some more visitors. Check the link for an update [possibly] on progress of the new war pension bill.